Tuesday was my third portrait session at Bath College, drawing using white cartridge paper and willow charcoal. The only other tool needed, or allowed, was a putty rubber which is used to lighten areas and/or take the paper back to as near white as possible. At least I didn't have to carry much on the bus and bought the cartridge paper (very cheap) at the college shop plus a new putty rubber. On this occasion we had a different model. Our starting point was to cover the paper with charcoal. The instructions were to draw the model with the charcoal stick or - as some of the more experienced did - form the shape just using the putty robber. We were specifically told the previous week that it had to be willow charcoal not compressed. As I have never done anything approaching this the latter was a step too far, so I used a piece of willow charcoal for the general shape and the features, using my measuring stick to try and get the overall dimensions and the distances between the features accurate. This stick is a green garden stake, slightly less than half the diameter of a pencil, around 10" long and with notches cut into it every 1/2 inch. I held this at arms length - arm very stiff and straight - while measuring. Prior to beginning Jackie laid out a series of reproductions of charcoal drawings, roughly A4 or smaller, both by famous past masters and some of her own. This was helpful to the newcomers, Pat and I, in establishing exactly what we were to try and emulate. I've shown two views because I've struggled to get a good photographic representation. The original looks better in the flesh but I think the above are reasonable. Even my wife thinks it good. Actually she said excellent! This was a fascinating session because it is all about shadow and light shapes and all you have to define them is a putty rubber and a piece of charcoal. As you know I am a `pure' (well not that pure!) watercolourist and how will this help my watercolour painting? I'm sure it will help portraiture. Downsides? Charcoal is dirty (very!) but fortunately Pat bought an aerosol of fixative at the shop and allowed me to `fix' my drawing so it arrived back home in more or less pristine condition. Next week and the following it is back to painting with Sarah, the same model from the first two weeks. Having had one shot at painting her in watercolour I am determined to do better this time. I hope to be in a similar position - facing her more or less frontally or slightly to her right, and have been thinking hard how to improve my approach and get a better result. Once again I found this a very stimulating session with Jackie quietly appearing at regular intervals to point out where things were not quite right or could be improved. Not a word of praise whatever. She is very unobtrusive but a hard taskmaster. When I was contemplating my original piece of putty rubber, black as the Ace of Spades, Jackie appeared and explained she had used the same one for years and showed how to knead it to a point to pick out whites. I attended my second session this week and this is a short description. The model, who I discovered is called Sarah, was the same one and once again displayed extreme professionalism. On this occasion we were allowed to draw or paint, whichever we decided, and in whatever media. I chose watercolour and this is the result. Sarah 16" x 12" Centenaire 140lb Not. Sarah's face was mainly in shadow, due to where I was seated- far from ideal, so next week I'm aiming to move and had a word with the tutor about this. I used pan paints with Cadmium Red and Yellow Light plus Cerulean for the skin colours and features. The Scarf was a mixture of Viridian and Hookers Green, and the cardigan a mix of Orange and Red. Brushes were Escoda 1214 retractables, Sizes 8 and 10 plus my small Isabey 6201. Next week we have a male model and are to do drawing using cartridge paper and willow charcoal. We were also told to bring a putty rubber. Another enjoyable session. Ann Blockley is a well-known and highly rated British artist, daughter of the late John Blockley who was one of the top watercolourists of his day. Like her father she painted initially in watercolour, but following in his footsteps has moved into experimentation with other media. She is known for her flower paintings but in this latest phase of her career is creating more abstract works, involving flowers and other subjects. Currently she has two books in print, `Watercolour Textures' in the Collins artists's studio range (2007) and `Experimental Flowers in Watercolor' (Batsford 2011). I currently have this book on loan from the library. It is profusely illustrated with her paintings, including many that are experimental. I quote one short section that illustrates the direction she is taking. We also have sand ,twigs, splodges, doodles, granulation material, bubble wrap, cling film you name it! The book is divided into five sections. An introduction that includes paint experiments, watercolour and mixed media and surface textures. We then have sections on Spring, Summer, Autumn and Winter and finally Flowers in the landscape. There is a lot of interesting stuff for flower painters if you like a loose to very loose approach. I like some of the paintings but there are many, where she veers very much into abstraction, that I don't find particularly attractive. I'm certainly not against an abstract approach but one can see Ann is feeling her way with this new direction, albeit boldly. Would I personally buy it? No, as I already have the texture book, which came as a requested Xmas present and I feel is broader based. I much prefer this book which has a wider remit covering flowers, animals, still life, buildings and landscapes. As it was published four years earlier she doesn't quite go to the same lengths in terms of experimentation, but the use of mixed media and other materials is well covered. There are also guest artists, including her late father to whom the book is dedicated. I don't think he was ever a conventional watercolourist, in the vein of Wesson for example, but changed and developed his work throughout his life until his late stuff appears totally changed, different mediums and a more abstract approach prevalent. He wrote a number of well-regarded books that are now difficult to find and command very high prices as collectors items. Like father like daughter it seems. Shirley Trevena is another guest artist, much admired, who has pushed the boundaries even further than Ann is currently doing. She has a new book (her third) out soon called `Breaking the Rules of Watercolour'. You can pre-order it on Amazon. What rules I say? Indanthrone Blue PB60, one of the least known or popular blues is the darkest valued pigment available next to Black Pbk6. There have been suggestions it is gaining more supporters and certainly all the main manufacturers include it in their ranges. The main criticism is that it is dull. It can also dry much lighter, up to 50% according to Handprint. With these swatches for comparison purposes I have mixed in two versions of Indigo and for further contrast French Ultramarine and Ivory Black. Originally I planned to do a piece purely on Indigo brought on by my recent purchase of the Daniel Smith version, which I like very much. Indigo isn't a staple of many artists's palettes - the late John Lidzey apart www.johnlidzey.co.uk - and can be mixed quite easily by adding black to one of several blues. I decided to major on Indanthrone Blue instead but include Indigo as the colours can be very similar. What mixtures do we have in the various versions of Indigo? Phalo Blue PB15 (which version?) seems to feature quite often, in the case of Rowney a PB15/Pbk7/PV19 mix, blue, black and red. Winsor & Newton is a similar mix while Schminke is PB15:1/PB66, Sennelier PB15/Pbk7 and Rembrandt PB15/Pbk6. I would say, just a suggestion, that if you like Indigo either mix it yourself by adding black to a dark blue OR stick to either Daniel Smith or Maimeri. Others may disagree having tried some of the other manufacturers paints. This assumes you have black in your palette which most artists don't, having been told (incorrectly) that black much like Paynes Grey, is a colour to avoid. Did you know that black was once regarded as `The Prince of Colours' by the old masters? It may be better to stick to Indanthrone Blue or in a limited palette leave it out altogether in favour of Ultramarine. The best compliments to Indanthrone Blue are deep yellows like Raw Umber, Raw Sienna (both PBr7), Gold Ochre (W & N PY42), Quinacridone Orange (PO48) and Gold (PO49). There are several others. For more suggestions see http://handprint.com/HP/WCL/mixtable.html . I mentioned the three swatches on the far right. They are nothing to do with this topic but for the interested I'll explain what they are. Daniel Smith do a very nice paint called Rose of Ultramarine. Yvonne Harry has bought it and likes the colour very much. It has been mentioned by contributors on Wetcanvas. Curious I looked it up and found it was a mixture of PB29 Ultramarine and PV19 Quinacridone Rose. The first two swatches from the left are attempts at matching it and the middle colour is very similar, a sort of mulberry shade. Forget the one on the extreme right I think I mixed in Perylene Maroon (PR179) by mistake OR it may have been the violet shade of PV19 from Rowney. Comments (or corrections) welcome. Yesterday 10th January my long awaited portrait course commenced. This was from 10.00am to 12.30am and I travelled to Bath on the local X39 bus complete with backpack and assorted art materials. On arriving at the College, not far from the centre of Bath and conveniently close to the bus stop, I went into the Macauley building as previously instructed only to discover the reception desk was missing replaced with four chairs and a coffee table! There was no indication of what to do so after a bit of head scratching I asked an official looking lady, who happened to be passing - the place is heaving - what had happened. She quickly explained that, as part of major restructuring and improvements currently taking place, the reception was now located in the Roker building and took me there. The Roker building is new and very impressive as was the new reception area complete with coffee bar. On enquiring and quoting my course number I was given a studio number and instructions how to get there. The place is like a maze and finding your way about is far from simple. By this time my fellow AVA artist Pat had arrived and we set off to find the room. After travelling down various corridors we entered only to discover it was empty apart from a young man who was stacking easels. We were (as instructed) early but time progressed and when 10 o' clock arrived still nothing. To cut this short the young man went off to check, returned saying we were in the wrong place and took us there because it was another trek to find the studio. The staff at the college are all very pleasant and helpful but I'd been told it was pretty chaotic and so it proved. After this unpromising start things took a turn for the better. The class were already at work, all present having done previous courses, and the tutor introduced herself. She is a mature lady and artist called Jackie Harding and couldn't have been more helpful. Already the previous bad vibes had been banished! She explained to Pat and I how things were done and we were provided with cartridge paper and various other bits and pieces to get us started. After selecting an easel and stool off we went. There were eight on the course, as I've explained, the model was already in place (apologies to her I've forgotten her name already), and Jackie gave us a sheet of paper with a number of key points to consider when drawing portraits. I'll probably publish these in a future post. My Drawing. Graphite on Cartridge Paper. During the first hour, until just after 11am, we completed our drawing. The model took no breaks and never moved, obviously very professional. At 11am Jackie called a halt for a break and most took off to the coffee bar near the reception, us newcomers noting the return route to the studio! After about twenty minutes we returned to find the model assuming another pose at a different angle. My effort on the right. This is full length, as was the other, approximately 23" x 16", cartridge paper, graphite and willow charcoal. For the drawing I used a Koh-i-noor mechanical pencil with a 5.6mm lead. The Completed Studies - Remember they are just that! Graphite and Willow Charcoal on Cartridge Paper each approximately 23" x 16"
We finished at around 12.20 and I must say I thoroughly enjoyed the experience. I was pleased with my first efforts especially as it was all very new to me. As for me being the oldest student on the Campus, or in this class, I'm glad to say this was not so! I'm looking forward to future sessions which will vary with both drawing and/or painting sessions. A word about the tutor. I had never heard of Jackie Harding but found her website www.jackieharding.com/Site/home.html I thought she was excellent. She was quiet and unobtrusive but managed the class effortlessly and is obviously an experienced teacher as her CV indicates. After an initial briefing for the two newcomers (Pat and I) we went straight into the drawing and she quietly moved around, occasionally suggesting improvements or corrections to individuals work. In this particular class 6 of the 8 members had been with her previously, some several times. There is a structured plan for the course and I'll return to it in future weeks. 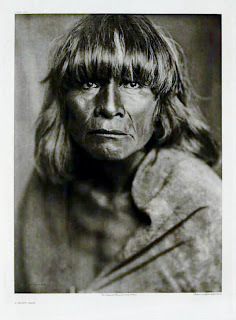 To start 2012 here is my latest subject, once more with thanks, from the photo archives of www.firstpeople.us/ of a Hopi man. The Hopi are a group of pueblo or village indians who have remained in the same territory occupied when first visited by Coronado's troops in 1540. They speak a Shoshonean dialect and mostly live on high mesas in the arid northeastern area of Arizona. They are said to have adapted better to modern civilization than many other groups of Amerindians. A very good reference is `American Indians of the Southwest' by` Bertha P.Dutton (University of New Mexico Press 1903 Revised Ed.1975). There is also plentiful information on the web - just Google `Hopi Indians'. For this painting I changed my colour combinations as I wanted a slightly different, more expressive, result. As I've constantly stated my approach is based on Charles Reid's style so super realism is out! For the skin colour I used a combination of Quinacridone Rust (Graham PO48) with touches of Burnt Umber and Cerulean Blue. This was to avoid the `pinkish' colour that so annoys Hap! For the first time I changed my usual Ultramarine/ Burnt Sienna/Burnt Umber combinations for darks and introduced Daniel Smith's Indigo (PB60/PBk6) in the hair. I used this straight, just varying the dilution, but sometimes added small amounts of Burnt Sienna. This can be the darkest dark imaginable but also dilutes down very well. I like this particular colour a lot and it may become a staple on my palette. Note PB60 as usually other makes of Indigo are based on either Prussian Blue (PB27) or Ultramarine (PB29). It is a convenience colour but WOW!! I also like the straight Indanthrone or Indanthrene Blue (PB60), without the black added, but it would be pointless to have both. There is also some Quinacridone Gold (Daniel Smith PO49) in the hair. The shirt has Yellow Ochre and Raw Umber with touches of Quinacridone Gold, Permanent Carmine (W & N PR N/A), and Cerulean (W & N PB36). I also mixed small amounts of Prussian Blue (Graham PB27) in the hair. Brushes were limited to my Isabey Series 6201 Size 6 retractable for the features, with Da Vinci Series 10 Maestro Size 6 and the Isabey Series 6228 Size 8, all Kolinsky sables. Finally I used a Pro Arte Series 3 Sable Size 00 for the tiny dots of white Gouache for the eyes. As I've pointed out before the Isabey retractable is much smaller than a normal Size 6, more like a longer and slimmer 4, but is a lovely brush for detail. Jacksons sell it www.jacksonsart.co.uk/ and there is also a smaller Size 4. Currently they are out of stock as I've recently ordered another 6 for a member of my AVA art group. I'm pretty pleased with this one as a start to 2012. As usual I concentrated on the face and head, starting with the eyes, then the nose followed by the lips. The clothing was painted in a minimal way just to suggest but not stress. In previous portraits I've had some problems wondering how to handle the clothing, especially not knowing the original colours, and in several cases overworked.